Totana.net - The CEIP La Cruz brings out his best smile on the "Day of Peace"
The CEIP La Cruz brings out his best smile on the "Day of Peace"
On Wednesday, January 30, the Cross School of Nonviolence and Peace was celebrated at the CEIP. 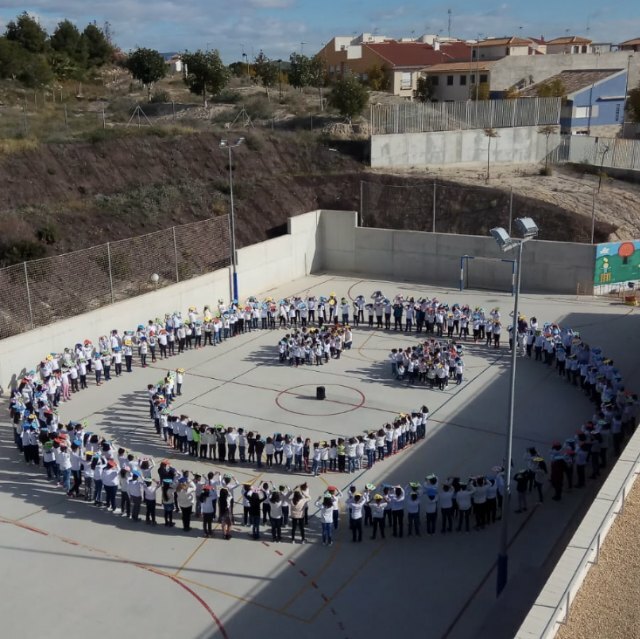 After a few weeks of intense work and reflection on the values â€‹â€‹of respect, tolerance, solidarity and camaraderie, an event took place in the schoolyard with the participation of all the members of the Educational Community. Under the motto: "PEACE BEGINS WITH A SMILE" the children formed on the floor a big smiley face and with senses messages about the importance of sharing our smiles, the act that culminated with the song was carried out: "YOUR SMILE" . This song is performed by a group of actors and singers to collaborate with the organization: CHILDREN'S ALDEAS. This organization is responsible for bringing smiles and happiness to children who live in difficult situations, providing them with a stable family environment. A representative of Aldeas Infantiles briefly explained to the attendees the work of this organization and conveyed her gratitude for our collaboration and involvement in the dissemination of it.